Built in 1861 Adstone Farmhouse was renovated in the year 2000 and offers well-proportioned accommodation over two floors in an idyllic corner of Shropshire. The house has lots of charming period features including high ceilings, cornicing and attractive fireplaces, while the current vendors have added a superb oak-framed garden room which they use as a dining room, underfloor heating, and French doors out to the garden. The large farmhouse kitchen features a Rayburn built into the inglenook fireplace, whilst off the kitchen sits the former dairy, while the cellar has been converted into an office. Upstairs is the galleried landing with doors to the four double bedrooms, all en-suite, and the family bathroom. Outside is a well-placed terrace and the gardens have a large lawn framed by beech hedging, wildflowers and there are also a variety of fruit trees – the grounds come to around two acres. A series of useful barns are located to the side of the property. 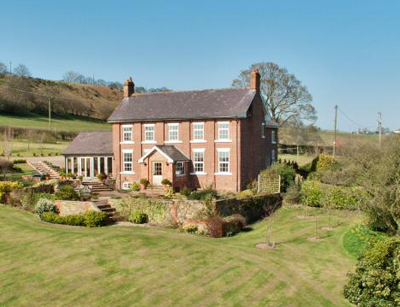 Adstone Farmhouse sits at the head of the Onny Valley overlooking The Mynd near the Shropshire village of Wentnor. Bishops Castle – five miles away -has all the necessary local amenities. The guide price is £600,000. For further information please contact Strutt & Parker on 01584 873 711 or visit www.struttandparker.com.